This is an example of a federally compliant Ohio driver’s license. The new federally compliant card meets national travel security requirements, and a federally compliant form of identification will be required to fly commercially or to access federal facilities or military bases and is mailed to residents after they go to a deputy registrar agency for the card renewal. This is an example of a standard Ohio driver’s license that does not meet national travel security requirements. This card would need to be used in conjunction with a passport or other acceptable documents approved by the Transportation Safety Administration in order to fly commercially or to access a federal facility or military base. 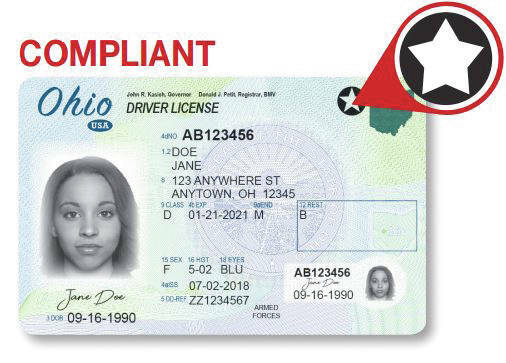 Changes implemented by the Ohio Bureau of Motor Vehicles last year to comply with federal regulations have changed the way Ohio residents receive driver’s licenses and identification cards. Last summer, the BMV introduced a new driver’s license and identification card in an effort to ensure greater security and identity protection for customers while complying with federal regulations. Ohio driver’s licenses and identification cards issued prior to July 2, 2018, will not be accepted by the Transportation Safety Administration (TSA) after Oct. 1, 2020. Residents still go to a deputy registrar agency for the card renewal and other transactions and have the option to choose a federally compliant driver’s license or identification card, but licenses and identification cards are no longer produced while a resident waits at the agency. The resident will now receive driver licenses and identification cards by mail. The new federally compliant card meets national travel security requirements and a federally compliant form of identification will be required to fly commercially or to access federal facilities or military bases. 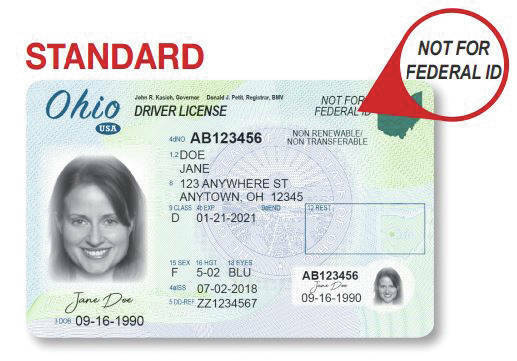 Obtaining a compliant card requires residents to provide identity documents to prove their full legal name, date of birth, social security number, proof of Ohio residency and proof of legal presence. A checklist of acceptable documents can be found on the Ohio BMV website at https://www.bmv.ohio.gov/NEWDL-ID/acceptabledocs.aspx. People who were born in Ohio can receive a birth certificate at the Champaign Health District, located in the county Community Center, 1512 S. U.S. Route 68, Urbana. Mary Collier, registrar for the Champaign Health District, said residents born in Ohio can go to any health department in the state to obtain their birth certificate. Locally, a birth certificate will cost $21.50 at the Champaign County Health District and the resident needs to provide their name, date of birth and mother’s maiden name. The local health district is open Monday through Friday from 8 a.m. to 5 p.m. The standard card does not meet national travel security requirements and the standard cards will need to be used in conjunction with a passport or other acceptable documents approved by the TSA in order to fly commercially or to access a federal facility or military base. Obtaining the standard driver’s license card does not require additional identity documents unless the card is being issued for the first time. Both versions of the identification cards will allow residents to prove their identity for tasks such as buying alcohol, obtaining social services, or registering to vote. Only a driver’s license can authorize the operation of a motor vehicle. The new card will be delivered in the mail around 10 days after visiting a deputy registrar agency and residents will receive an Ohio interim identification form until the card arrives in the mail. The interim identification form allows residents to operate a motor vehicle and only serves as confirmation that the application is pending and not a form of identification.